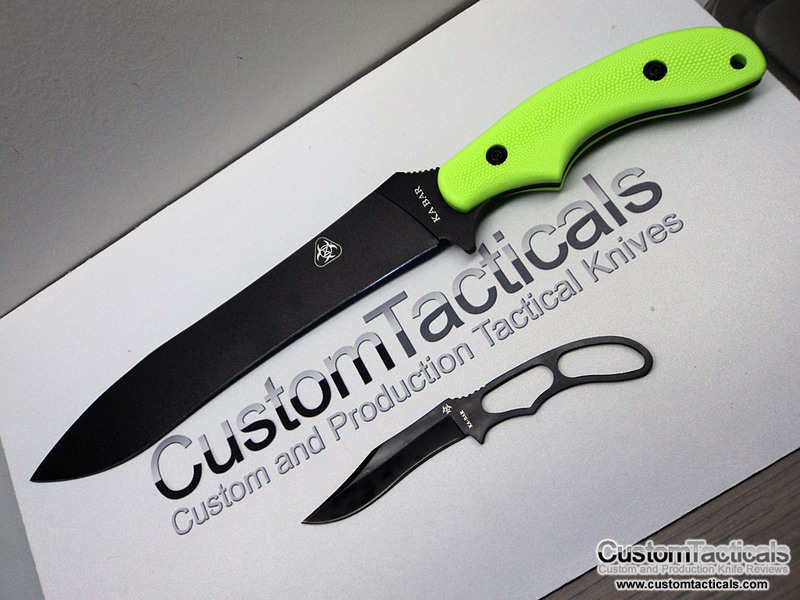 But if you don’t like the neon green handles, all the knives in Kabar’s ZK line have interchangeable black plastic handles as well. 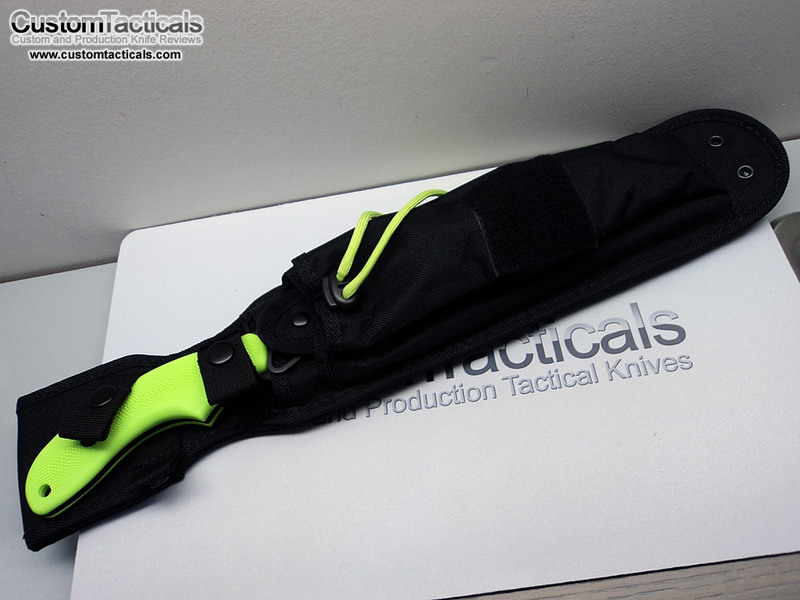 I personally elected to swap the handles out and install the black ones, mostly because the green is a bit too eye catching when taking it out and I’d rather have something a bit more subtle, as subtle as a 15″ knife/sword can be, that is! The SK-5 High Carbon Steel that Kabar uses in their ZK War Sword is basically the equivalent of 1080 Carbon Steel, which is a good and reliable carbon steel. Since Carbon Steel is susceptible to oxidation and rust, the powder coating is a very nice feature to have especially on such a large knife which has many more areas that could get rusty. The blade came quite sharp, and I’m pretty happy about that. Big knives take longer to touch up and can be a bit more trouble. This one has a thinner blade than most fixed blade knives, probably because it is so long. The slight machete style blade shape should make it a good chopper, and the long flat-ish edge should make it a decent camp utility knife. The knife comes with two handles, both identical except for color. Neon Green and Black are the two that it comes with, and they are both pretty basic black ABS plastic with small round traction bumps all over them. I believe several hobbyists out there make G-10 upgraded handles for these and the other ZK knives for $30 or so, which I don’t feel is necessary, especially for a knife that’s only around $55. The grip isn’t substantial but if you wanted extra grip you could always file down the plastic and use some grip tape or just wrap the handle with some grip tape. This knife has great finish and finish for the price point. It is made in Taiwan, and has straight grinds and no uneven peculiarities to speak of. The blade powder coat takes away the need to finish the blade too much, and reduces costs and also increases the durability of the blade. Overall, very well finished and the handles fit flush to the knife. I’m really satisfied with this knife and it is a nice chopper. Haven’t taken it out to the camp yet, but I suspect it will perform very well in general camping and utility chores, even though the blade is a lengthy 9 3/4″. 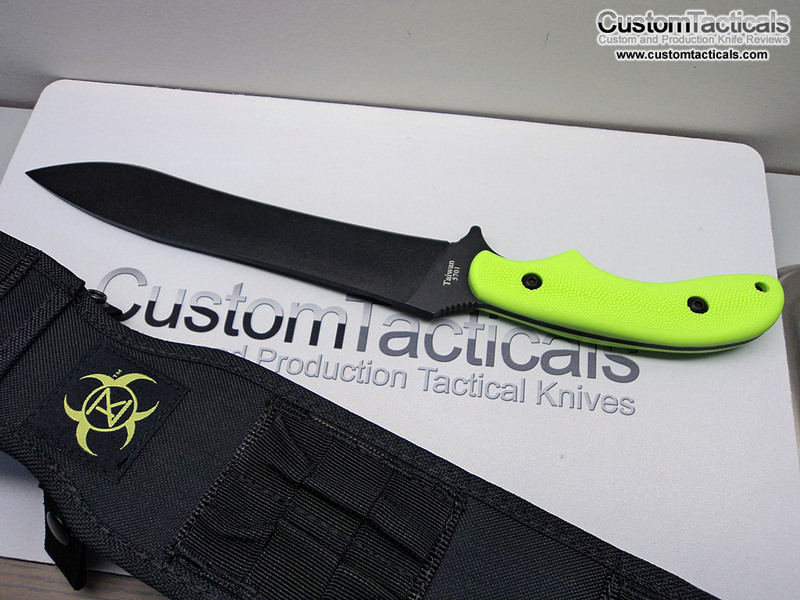 Really dig this blade for the fun factor as well as the design and quality of the construction and finish. Recommended.